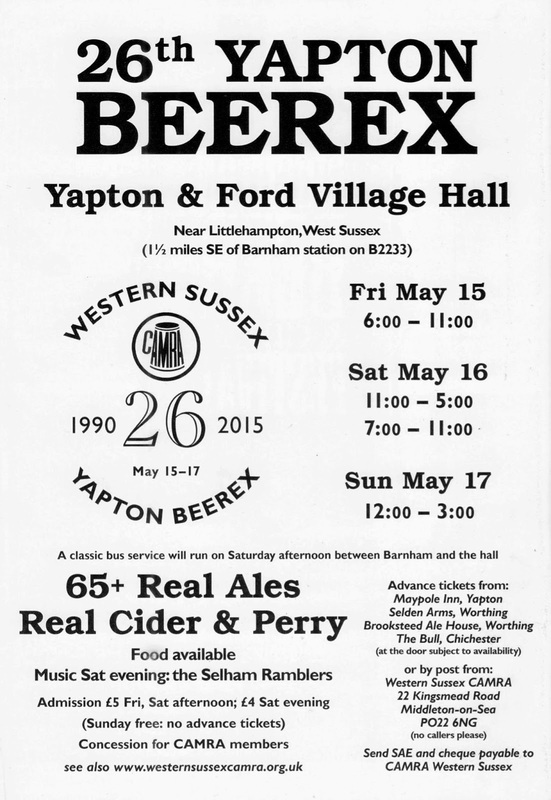 There is a fortnight to go until the Yapton Beerex, the annual festival of the Western Sussex Branch of CAMRA. It will take place from Friday 15th May to Sunday 17th May in Yapton Village Hall, situated on the B2233, 1.6 miles south east of Barnham railway station where all trains stop. The nearest bus stop is for the Stagecoach 700 service, 200 yards across the green at Sparks Corner. It is planned to have 65 beers from small, independent breweries. There will be plenty of specially selected golden, hoppy beers, as well as beers from the north of England, while the festival this year will be featuring new Sussex breweries. There will also be a range of bottled beers, both British and imported, and a lot more ciders and perries. The usual refreshments of filled rolls, burgers and hot dogs will be available. The Saturday evening session will feature music from the Selham Ramblers. Admission to this session is £4 (Sunday remains free; other sessions are still £5). There are no advance tickets for Sundays - just turn up: entry will be free and there should be at least 25 beers still on. Tickets will be available on the door for all sessions, but the Saturday lunchtime session is usually sold out, so the advance purchase of tickets is advised for this session. In the event of fine weather on this session, however, many customers sit on the grass outside; hence more people can be admitted at the door. To book, please send an SAE and a cheque payable to Western Sussex CAMRA to Western Sussex CAMRA, 22 Kingsmead Road, Middleton on Sea, PO22 6NG. (No personal callers please.) Don’t forget to say which sessions you want tickets for! You can also buy tickets over the bar at the Selden Arms and the Brooksteed Ale House, Worthing; the Bull, Chichester, and the Maypole Inn, Yapton. A vintage bus service runs from Barnham to Yapton Village Hall during the Saturday lunchtime session; the bus will depart from outside the Murrell Arms (turn right out of the station and walk under the railway bridge on the right - approximately 300 yards). If the weather is considered suitable, the bus will be an open-topper. Please note: there will be a small charge in both directions for a seat on the vintage bus (accompanied children go free). Seats are allocated strictly on a first-come-first-served basis, and possession of a Beerex admission ticket does not guarantee a seat on any bus. Approximate departure times from Barnham station are: 10.25, 10.55, 11.25, 11.55, 12.25 and 12.55. The return timetable will be on display at the festival.